Chobani has responded to a trademark infringement suit focused on its "How Matters" marketing and advertising campaign, issuing a statement calling the suit "baseless and without merit." The lawsuit was filed in U.S. district court in New York on June 4 by Dov Seidman, author of the bestseller HOW: Why HOW We Do anything Means Everything and his company LRN, a business ethics consultancy. It alleges that Seidman owns federal trademark registrations for the word and mark "HOW" and that in creating the "How Matters" campaign, Chobani and its agency, Droga5, knowingly infringed those trademarks and engaged in unfair competition. Chobani's ongoing "How Matters" marketing campaign stresses its use of "only real, natural" ingredients, its local sourcing, "authentic" straining process and "responsible manufacturing." The campaign launched during this year's Super Bowl, and was also employed during the Winter Olympics and the Academy Awards show, as well as in digital media. Statements in ads have included "A cup of yogurt won't change the world, but how we make it might," and "It's not just what you do, but how you do it that matters." The core message of Seidman/LRN, as summarized on the company's Web site, is that "it's no longer what you do that matters most but HOW you do it." Among other points, the suit alleges that Chobani and Droga5 discussed Seidman's/LRN's marks and message during a meeting in late 2013, and cites a tweet sent by Chobani to Seidman on January 29, 2014. The tweet read: "@DovSeidman Thanks for inspiring the world to care about "how." Can you help inspire the food industry, too?" "The very next day, Defendants launched Chobani's new branding platform -- which employs 'HOW' in precisely the same manner as Plaintiffs employ their HOW marks: as a noun connoting responsible and ethical corporate behaviors," states the suit. Seidman is seeking an injunction to stop Chobani from using any marketing that includes the allegedly infringing messaging, and damages including any profits Chobani has earned as a result of the actions alleged in the suit. Chobani's response statement says in part: "Mr. Seidman's allegations are baseless and without merit. 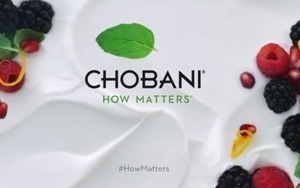 Chobani chose 'How Matters' as its platform because it represents what Chobani has always stood for, including its use of natural ingredients to make wholesome and nutritious food. Mr. Seidman does not own a trademark registration for 'How Matters' and has never used that phrase as a trademark. Numerous other companies use phrases including the word 'how' in connection with marketing language and corporate social responsibility phrasing, and Mr. Seidman himself argued to the trademark office that there is no likelihood of confusion in circumstances similar to these. We are confident that our use of 'How Matters' does not violate any legal rights of Mr. Seidman, and accurately portrays who we are and what we do." Chobani, the nation's leading Greek yogurt brand, spent $31.4 million on TV ads during this year's first quarter, according to iSpot data cited by The Wall Street Journal, which also reported that the private company's sales rose 30%, to an estimated $1 billion, last year. Various media and analysts continue to speculate that Chobani, estimated to be worth $5 billion, is considering an initial public offering. According to his bio on LRN's site, Seidman is a Harvard Law School graduate who also earned a bachelor's and master degree in moral philosophy from UCLA, and a BA in philosophy, politics and economics from Oxford University.